I love aeroplanes. Fortunately for me, so does Big Guy. When he read that a refurbished B-17, a Flying Fortress, was coming to our little pueblo of Santa Tourista, we knew that we had to go and check it out. As you can see it was named after that famous small-game hunter, Elmer Fudd. It didn’t really have 85 missions as the bombs painted on the side seem to declare. It never actually flew in combat. But, it’s still cool. I got to sit in the pilot’s seat. I make a pretty good fly-boy I think. Big Guy has a special place in his heart for the B-17. When he was in high school, he went to work at Northup aircraft building B-17s. The group that owns the “Fuddy Duddy” takes it, and other planes, around the country. People can go in them and even in take a flight in them. These old planes aren’t going to be around forever. It’s a wonderful experience to go inside one. You can imagine for a minute how these young men fought the war. You had to be young to last in one of these bombers. I don’t know exactly how many B-17s were lost, but there were a lot. The fellows who were in especially vulnerable positions were the belly and tail gunners. You can’t imagine how it was until you’re in a B-17. 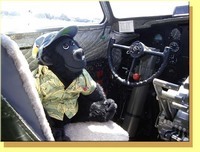 Sitting in that pilot’s seat, I felt transported back in time. This isn’t a high-tech experience, but it must have been hair-raising. Pretty soon it will be the 60th anniversary of V-E day. Let’s remember the young men who went off to war so long ago and not forget those who didn’t come back. Nature seems to have a way of trumping our imaginations. When I look out in the night sky I do see stars, but other than that the sky seems calm. Well, there is the occasional shooting star, but other than that the universe doesn’t begin to let us in on its secrets. 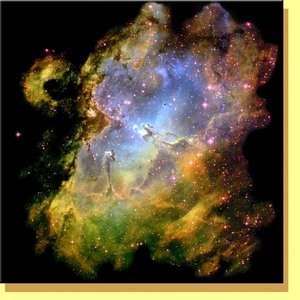 These pictures are of one of the universe’s secrets: the Eagle Nebula. The Hubble telescope took the pictures and NASA released them the other day. The Eagle is an incubator for galaxies. Those are stars being born there. What’s more, this picture is just a part of the nebula. The whole nebula is nine light-years tall. That’s more of it in the second photo. I can’t even comprehend something that big. One of my favourite books is Kurt Vonnegut’s “Slaughter House 5.” The hero, Billy, travels through time and space. We never know whether it’s just in his imagination or not. 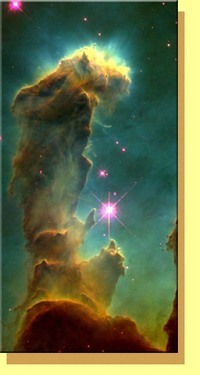 I would love to get a glimpse of the Eagle nebula up close. Grams says, “that’s the last glimpse you’ll get my fuzzy friend!” Well, I can dream, can’t I? Feel like a little time travel? Meet me at the Restaurant at the End of the Universe. Oh, and don't try the veal. Trust me on this one and Don't Panic. 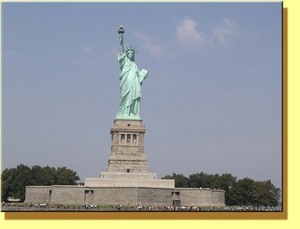 A few days ago, I wrote about different examples of Lady Liberty around the world. 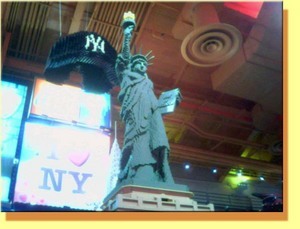 I had totally forgotten about the Lego Lady at the Toys R Us in Manhattan. Ain’t she a beaut’? Everything in the display is made with Legos. How cool is that? That’s all I have time for today. 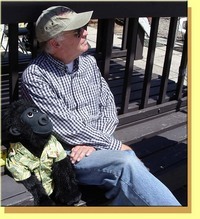 I’m re-editing one of my books. I’ll get back as soon as I can. After I tell you this next bit, you’ll understand why I say that I’m a very tolerant soul. Grams has a theory about shopping carts (trolleys, to my chums in the UK). She had noticed that when we go out in the morning, there are shopping carts gathered all over the neighbourhood. These carts are in various states of disarray. We never see people rolling them away from the local business, the carts just appear. So, Grams has decided that these are carts gone wrong: they are shopping cart gangs. 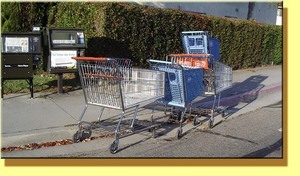 The carts gather in regular spots, near the creek, by the newsstand, near the park, and so on. Sometimes we’ll see a lone cart, but more often they lurk about in ominous groups. Henri says they have a wine and beer drinking gathering by the creek. Grams suspects that it’s more ill-omened than that. “It’s just like in ‘The Birds,' I tell you! Pretty soon these gangs will be taking over the neighbourhood!” Of course we all remember the movie, “The Birds,” benign avian flocks turn into killers. The group pictured here are the usual suspects. According to Grams, they’re looking for news of their recent escape at the newsstand. The difference this time is that that one cart appears to be carrying a baby cart. Well, even criminal carts have families, I suppose. As I said, I'm a tolerant soul. I took the other two photos around our town, Santa Tourista. We get a lot of passers-through here and these 2 amused me. The “Don’t Mess With Texas” had definitely been messed with, In addition to the Denver boot locking up the wheel, someone had caressed the bumper. There used to be a bumper sticker here in California that was popular. It said, “Welcome to California, Now go home.” ‘Nuff said. I took the last photo because this made me laugh. 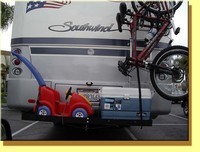 Is that little car an example of alternative transportation? Maybe if the cost of petrol in our county broke them, they could just pedal away. Well, the bikes would probably be more useful in that event; but I like that little car. "A mighty woman with a torch, whose flame Is the imprisoned lightning, and her name, Mother of Exiles. From her beacon-hand glows world-wide welcome . 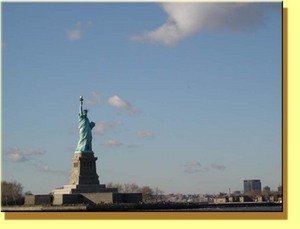 . ."
A while back I wrote an ode to my favourite lady: the Statue of Liberty. Lady Liberty was conceived and given to America out of love for an idea. She stands in the harbour with love in her heart and hope in her torch lighting up the sky. I thought how sad this was, mainly because the Lady means so much to so many people. Then, I thought, well all Americans must think of her in a special way too. Then I found a picture of another Liberty in Las Vegas. I suppose that it’s the iconic status of Liberty that explains her presence in Las Vegas. They do, after all, also have an Eiffel Tower there in the desert. Of course, when you get to the top of the Vegas Eiffel Tower all you see is Las Vegas. Me, I’d rather see Paris. Now looking at the real Lady in the harbour, or her little sister on the island in the Seine, there is a real sense of her power. She, of course, can do no more than stand sentry in the harbour. But, she challenges our imaginations to think about what she represents. She challenges us to be as great as she. I’ve said it before and I’ll say it again, Wotta Woman! The Grams is one of my favourite people, as far as people go. She understands me better than I understand myself sometimes. I think that it may have to do with the fact that she’s never quite grown up. Now, this is a kind of amazing thing when you consider that she’s going to finish her Chinese Lunar cycle this year. She was born in the year of the wooden rooster, and this is the year of the wooden rooster again. A cycle only comes around every 60 years, so you don’t usually get a chance at completing a second cycle. This photo was taken when the Grams was very preggers with Henri’s Mum. I always think that in this photo she looks like that picture in the Uffizi – you know, by Botticelli of Venus on the half-shell. That was the one painting that Henri’s Mum had to see when we went to the Uffizi. What a wonderful day that was carousing all over Firenze. It was Henri and his Mum’s first time in Firenze. We got to show them all of our favourite spots. We had lunch in a trattoria that we like and then we went to the Uffizi. After lunch, Big Guy got a toy train for Henri. The two of them went to play with it back at the Ritz whilst Grams, Meg and I went to the Accademia to see the real David in all of his glory. That night we went for dinner at the The White Boar. Henri turned to his Mum and said, “I’m tioured,” and promptly fell asleep on her lap. We had to call a cab to get back to the hotel even though it was just a few blocks; because Henri was just too big for any of us to carry. The driver was very understanding and we gave him a big tip to make up for the small fare. And then we all trundled off to bed. There are few perfect days in this life, but that was one. Sono Gweeds e mi piace l'Italia! When we took our Welsh friends, Emlyn and Marian, to see the Santa Barbara County Courthouse they were gobsmacked by the beauty of the place. It’s hard to believe that a public building would be conceived to be so beautiful and kept that beautiful with so much care. It was built over 75 years ago and it shows no sign of wear. A cool breeze greeted us as came to this staircase. Marian went up the staircase and then looked back and took the first photo. The mild weather allows for the open-air and the beautiful garden plants caress the outer railing. The inner posts are dark and the outer ones are light. The only concession to modernity (and liability I suppose) are the safety strips on the edges of the tiles stairs. 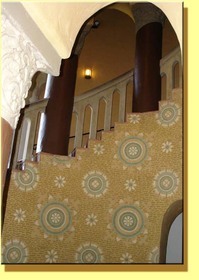 In the second picture, you can see the beautiful design on the inner staircase wall. What could prompt a city to build such a beautiful public building? The answer to that lies deep in the past. But aren’t you glad they did? Yesterday’s post made me think of other things that have been copied from other older cultures. Also, I remembered that the Santa Barbara Country Courthouse, which we visited recently, has just been designated a national historical site. 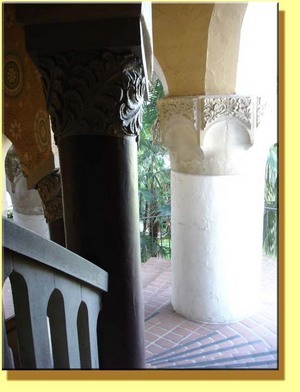 One thing that we noticed when we entered the courthouse was how much it resembles the Alcazar in Seville, Spain. We had been in Spain in December of 1999 and had celebrated the millennium New Year’s there. During our time there we took the wonderful AVE train down to Sevilla (Seville). With Grams commandeering the map, we somehow stumbled around and found the Alcazar. 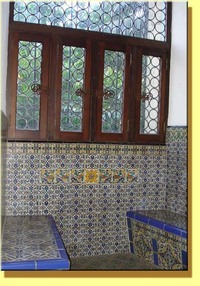 We were gobsmacked by the incredible tile work throughout the Alcazar. After Ferdinand and Isabella re-conquered Spain from the Moors, they also took possession of the palaces of the Moors. That included the Alcazar and the Alhambra. As you walk through both palaces, you can see how the Spaniards put their insignia over some of the tiles. It’s a bit like graffiti. Fortunately, they didn’t do much more than superficial damage at the Alcazar. At the Alhambra, they actually built another palace within the Moorish splendour. But, that’s for another day. Sevilla is as different from Madrid as Madrid is from Barcelona. Sevilla is very laid-back. It feels more North African than any city in the north. It’s beautiful. I could have stayed all day in the garden at the Alcazar. Which photo is the Alcazar and which one is the Santa Barbara County Courthouse? Well, I’ll give you a clue: click on the photo of Big Guy and look at the book he’s reading. 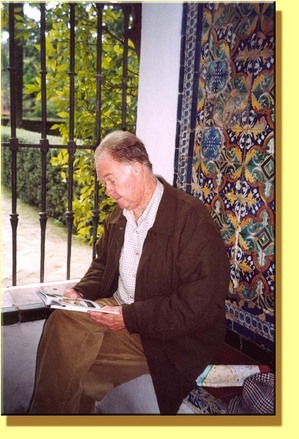 In case it’s too small for you to see, it’s a guidebook of Spain and he’s in the Alcazar. Everyone has an opinion and they’ll usually be more than willing to express it. Yesterday, I extolled on the virtues of golden California. I posted two incredible photos from our trip to San Simeon. Wouldn’t you know it? Grams looked at one photo and said, “Ooooh, that reminds me of Fiesole. As a matter of fact, I think that I have a pic that looks very much like that one.” She pulled out the albums and, sure enough, she found the first one here. 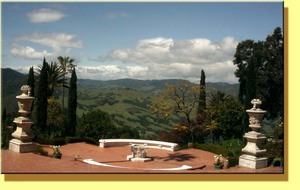 I realized then why I was so drawn to that spot at San Simeon: it reminded me of Fiesole. None of this in any way diminishes the beauty of California. The golden state will always shine bright. It’s just that I do have a soft spot in my heart for Italy. Fiesole itself probably has fewer antiquities than Mr. Hearst amassed at San Simeon, but the antiquities at Fiesole have been there since, well since antiquity. The area just behind Big Guy in the photo has architecture and art dating back to Etruscan times. It even has an amphitheatre from the Roman era that is still used today. One of the best things that Italy (and the rest of the world) did for itself was to finally protect its antiquities. Italians tend to be self-deprecating over their modern achievements, but they still glow with pride over their ancient past. Who can blame them? It’s glorious. 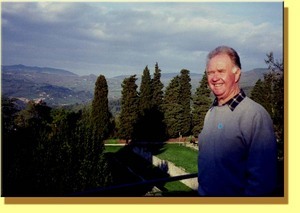 Of course, just down the hill from Fiesole is Firenze (Florence), the birthplace of the Renaissance. So, the experience of Fiesole and Firenze goes from Etruscan times to beginnings of modern culture. This isn’t limited to this area, however. You can experience this all over Italy with the ancient and the modern living side by side. Sono Gweeds e mi piace l’Italia! One of things that struck me when we visited San Simeon was where it is situated. La Cuesta Encantada (The Enchancted Hill) has a commanding view of the Los Padres Mountains and the Pacific Ocean. While Hearst’s castle itself is amazing, the view from it is breathtaking. It’s impossible to take a bad picture. I could have just sat on that bench in the first photo all afternoon. The clouds were amazing that day. This is what the gold of California is all about. It isn’t anything that you can put in your pocket or spend; it does fill your heart with pure unadulterated beauty. Of course, we who live here sometimes take it for granted. It’s good then to see it through someone else’s eyes. When we visited San Simeon, we were with Marian and Emlyn and they are from Wales. I love Wales and flatter myself that they get to see Wales through my eyes and appreciate it even more when we travel there together. Well, here in California they made me see things that I hadn’t noticed for a while. So, it works. Take a visitor around your neighbourhood, see it through their eyes. I’ll bet you see it again for the first time. One aside, the state of California has done a fine job making San Simeon a wonderful experience. From the new-built facitlites to the knowledgeable tour guides; it is a wonderful example of the state at its best. Eleanor - the picture of the pool is for you. Thanks.